The clone tool is useful for removing unwanted items in a photo. 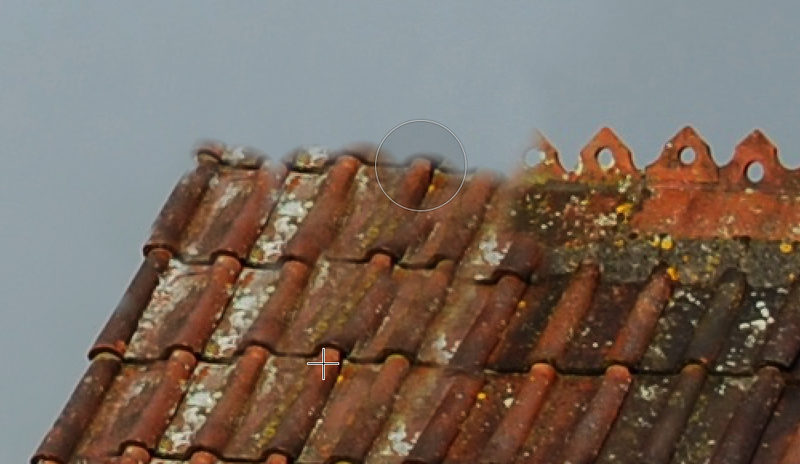 With the clone tool you are able to copy a part of an image and apply that over an unwanted item to cover it. For this example, a chimney will be removed from the roof of the house. When you have your clone tool selected, you will have to define a clone source. The clone source is the area you will use to cover up the part of the image you want to remove. 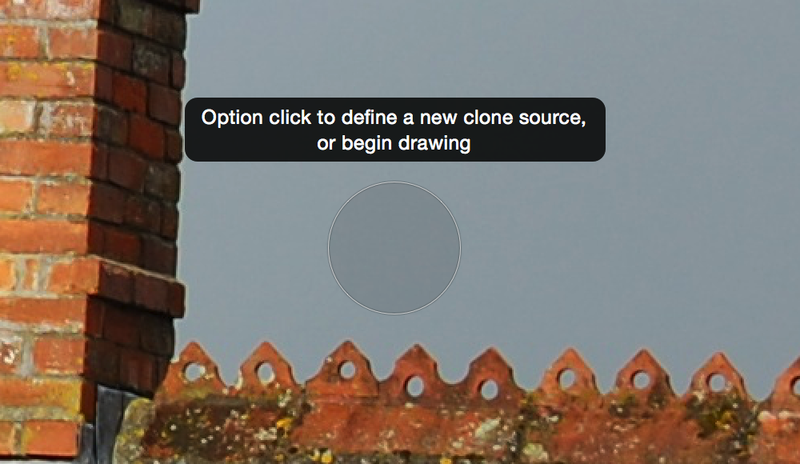 In this example, the clone source is selected from the sky. Make sure to select your clone source as close as possible to the object you want to cover. 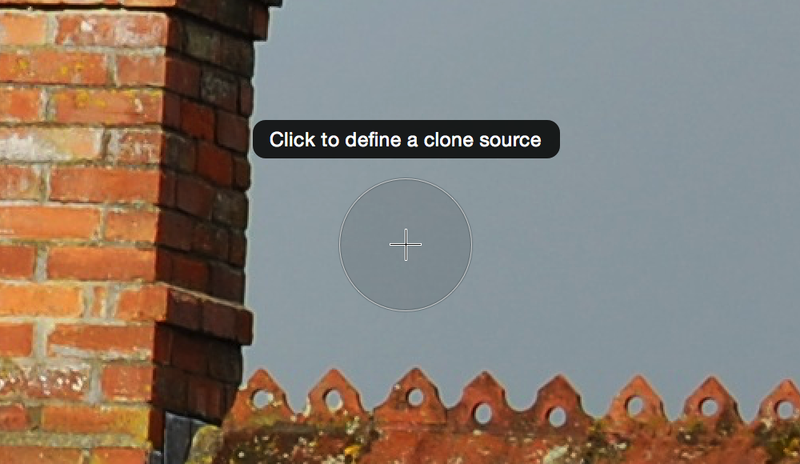 To select a new clone source, hold the Option key and click with the white circle on the space you want to clone. 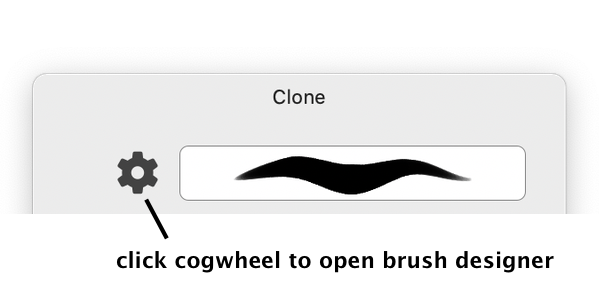 To adjust the softness, flow, and other parameters of the clone tool, click on the cogwheel icon in the inspector palette. The brush designer window will appear. Play around with the softness and flow sliders in particular to avoid hard edges around your cloned area. You can also pick a different brush to use while cloning by clicking on the brush preview in the inspector palette. You have a variety of soft and hard edge brushes to choose from. Now you may begin retouching the image. 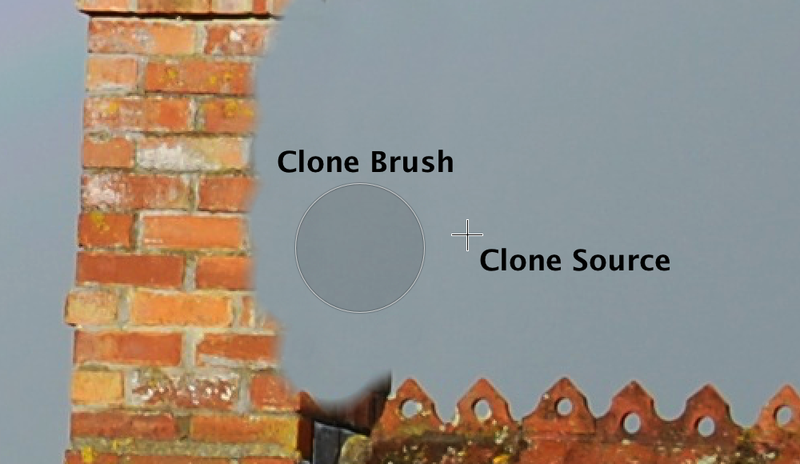 The circle is your clone brush, and the ‘+’ is your clone source. The chimney has been removed from the area with the sky. 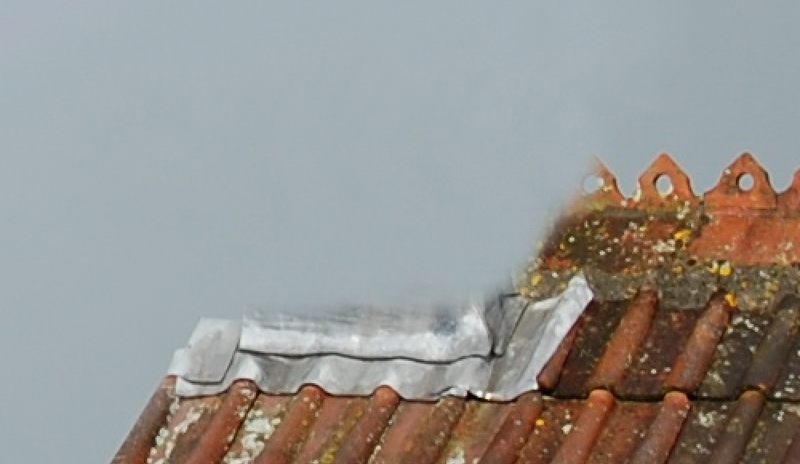 Now it is time to remove the remaining parts of the chimney where it attaches to the rooftop, and fill it in with tiles. For this part you will need a smaller brush. It is important to adjust the size of your brush to match the part you are trying to clone. Start with cloning the tiles to replace the silver colored water barrier. 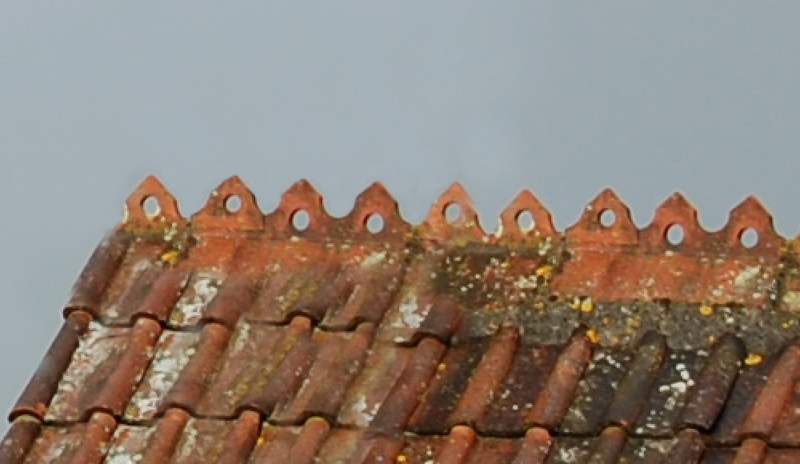 To do the roof line, use a slightly larger brush. When cloning a patterned surface, make sure to move your brush with the angle of the pattern. It is best to use a lower level of softness for this part, around 20% works well. 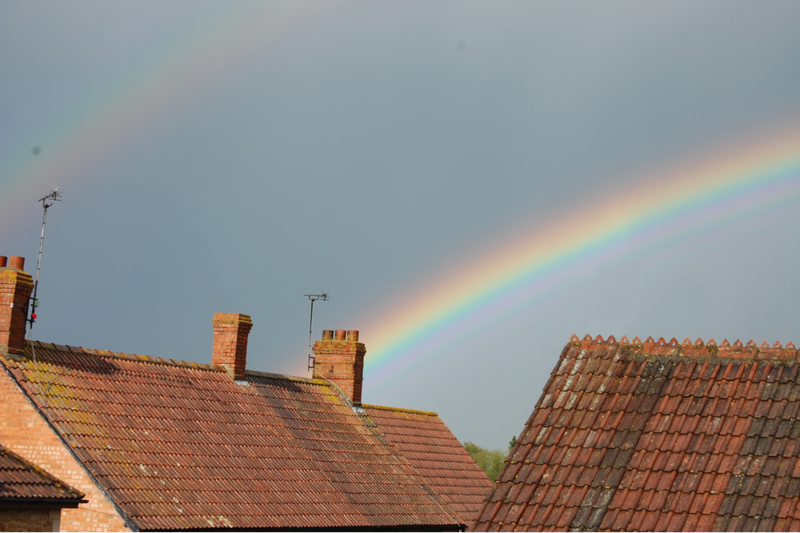 Cloning the rainbow to fill in the area where the chimney is a bit trickier. Try using a large brush size with 30-40% softness to cover up that part of the remaining chimney with just a single stamp of the brush.